Through our TURNKEY DIGITAL OVERSIGHT program at SEOversite, our Client Director and on-call Web Guru team has worked with The Wise Center team, including the doctor, Director of Marketing, and operations management personnel to create a robust online presence. Recommending SEOversite Preferred Vendors and overseeing each project has led to a tremendous increase in leads and website visitors. Over a period of several years we have overseen the revamping the main website, built two additional specialty websites, changed pay-per-click teams, added live chat, in-office ratings and reviews iPads, and more. The result: over a 500% increase in leads and sales from online sources leading to massive growth in revenue and profitability. In many cases, SEOversite clients request a site redesign. In this case, however, we took an existing dated website and updated it. By adding doctor accolades, logos and trust signals, improving ease of navigation, and placing easy-to-find contact submission forms and calls to action, we saw an immediate improvement in conversion rate. 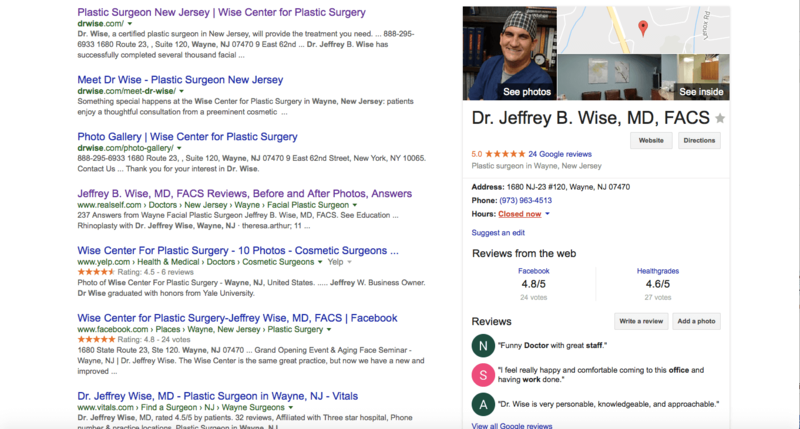 With several websites drawing leads in a relatively small town - Wayne, New Jersey - we have helped oversee a process that has led to one of the most successful websites in cosmetic medicine nationally, driving hundreds of new inquiries each month. Achieving superb SEO, rankings, authority, and reputation takes a holistic approach. Dr. 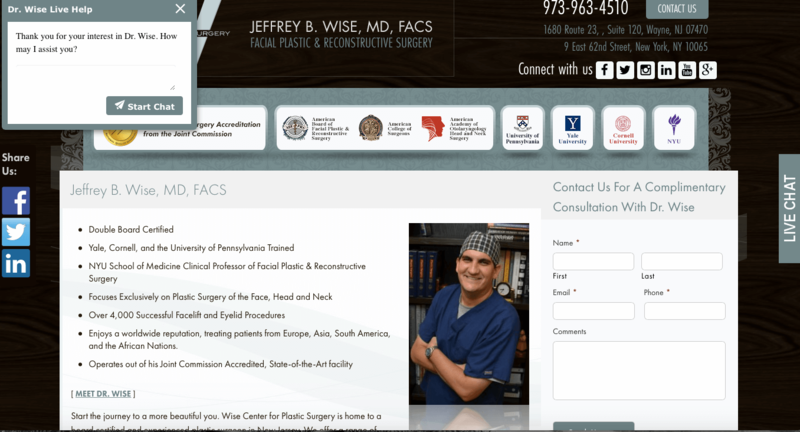 Wise took advantage of our SEOversite LITE service to get a referral to ratings and reviews experts that assisted him in compiling happy patient testimonials. He now has hundreds of positive online reviews on Google Reviews, Facebook, Vitals, RateMd, and more. Utilizing our TURNKEY DIGITAL MARKETING OVERSIGHT Client Director, the Wise Team made wise choices leading to first page results for nearly every major search term in their market and the surrounding areas.